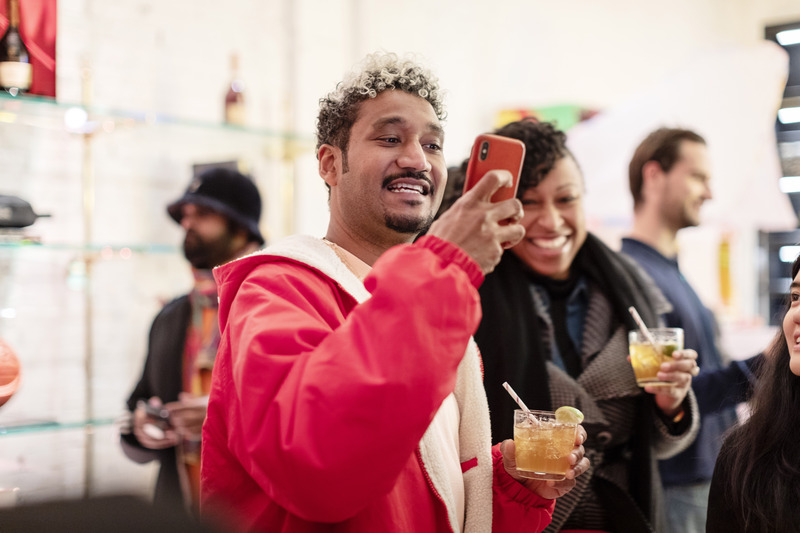 Don C & Rémy Martin Host Exclusive “Just Rémy” Release Party in NYC | RESPECT. Last week, Rémy Martin celebrated the launch of the fourth piece of the exclusive “Just Rémy” capsule collection by world-renowned, luxury streetwear designer, Don C. Held at premium streetwear and luxury goods store The Webster, the event provided influencers and tastemakers with an exclusive sneak peak at the newly released Dopp Kit. The fourth piece of this limited-edition collection is the Just Rémy Dopp Kit. With the signature streetwear style of Don C, the Dopp Kit is designed with a luxury twist that transforms a necessary travel accessory into a unique fashion statement. Made of black lambskin leather with gold hardware and red python piping, the kit also features a gold embroidered “Just Rémy” logo which marks its authenticity. The “Just Rémy” Dopp Kit is available for purchase for $350 in a limited supply on JustDon.com and in-store at The Webster (2508 29 Greene Street, New York, NY 10013). And check out the “Just Rémy” cap, ($350) and jersey, ($750), at The Webster, also available for a limited time. The Collector’s Series is a program that celebrates the premium promise of Rémy Martin through the collaboration of leading lifestyle brands and designers who are at the crossroads of luxury and lifestyle. The “Just Rémy” partnership, which is the first installment of the series, intertwines fashion, basketball and luxury to create signature pieces exemplary of the iconic Rémy Martin brand. With a focus on basketball culture, the collection presents premium basketball essentials that double as timeless lifestyle pieces that are essential beyond the court. The Collector’s Series launched in October in Don C’s hometown of Chicago with the debut of the 1738 Sneaker Box, available for purchase nationally. Following the launch, the second piece in the collection, the “Just Rémy” cap, was unveiled this past November in Los Angeles. The third release was the “Just Rémy” jersey, announced during Art Basel in Miami and the final item in this curated collection will be announced next month.